Every university is different. I’ll give you a little insight as to what my schedule was like when I played at Texas A&M. Coming into the fall season, right when school begins, most schools have a conditioning test to make sure that the players were doing work over the summertime. It’s usually a pretty big deal, as it’s the first glimpse at the team to see who put in time and effort over the summer to become better. I feel like during the conditioning test you learn a lot about your team; you even learn who are going to be the leaders. Not only did we have a conditioning test (ours was called the Gasser test), but we also had to get tested on our bench press max, vertical max, agility time, squat and deadliest. For the freshman, the first time you get all these numbers, it is used as a baseline. For the sophomores, juniors, and seniors, this number is used to monitor and compare to make sure you’re getting stronger, and once again, to make sure you worked out over the summer. For those sophs-seniors, if they did not come back in shape and pass all their tests, then they had to go to what we call Club Del Ray (our strength and conditioning coach’s name was Ray). CDR are extra workouts during the week first thing in the morning in the fall to get you BACK into shape…preparing you for season coming up in the spring. As a freshman we were required 8 hours of study hall a week. This study hall takes place usually at night between the hours of 6-10. Those were the most popular hours athletes were getting in their study hall time. Athletes of all sports – football, basketball, volleyball, etc. You go, check in, get work done, check out and leave. The way you get out of study hall hours, is to keep a high enough GPA. At your freshman year, if your GPA is high enough, you will no longer be required to go to study hall on an hourly weekly basis. If your GPA drops at any time during your 4-5 years playing softball, then you’ll be required to go back. As a freshman, we were required to live on campus. When I was there, we had to live with someone from a different sport; I lived with a golfer. 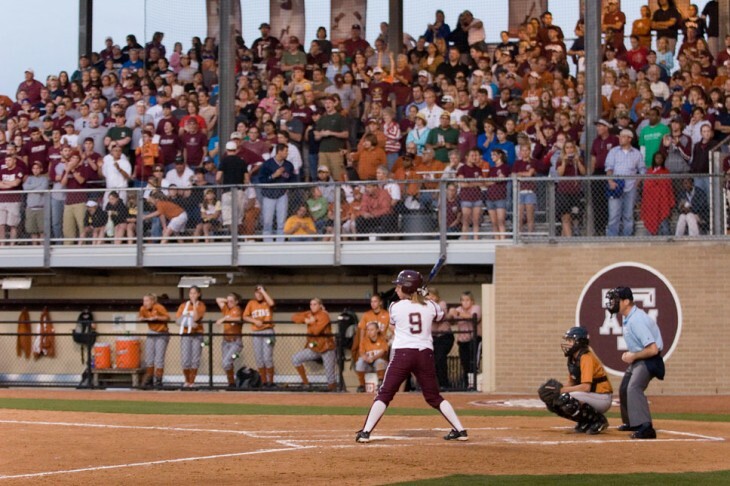 Now, the girls at A&M generally live with another softball player their freshman year, and they still live on campus. A typical “full time” course load is 12 hours. As a general rule, 3 hours = 1 class. So in any given semester, you’re taking at least 4 classes. Some players will take 15 hours (5 classes) depending upon how heavy the classes are and knowing how much required work will go into them. Softball practice is a little different in the fall. 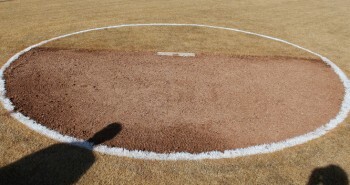 During the fall, you will have about a month (the coach can decide when this takes place) of team practice. This means that the team will practice every week day from certain hours, say 3-6, and everyone gets to be out there together. Other than that month of team practice, you are doing what is called Individuals. Individuals are much more limited, as every player is allowed only 4 hours with the coaching staff per week. This is tough, especially for pitchers who hit, because you have to split up 3 things during that 4 hour week: hitting time with coaches, pitching time with coaches and defensive time. Now remember, the team practice time and individual time are limited based on the coach requiring you to be there. Outside of that required time, you can, and are encouraged, to get more work on your own. So that is just a basic schedule for a freshman, and everyone’s will vary based on class times during the day. The weekends in the fall are generally reserved for recruits to be coming into town (you hang out with the recruits as a team) and also reserved for football games! In that 1 month I told you about in the fall where you have team practice, you will also played around 10 games. Could be a little less or more. These games could be against anybody – Blinn Junior College or Texas State University. They will vary. They generally will be games with teams that are from close by to limit travel since and also teams that are not in your conference. 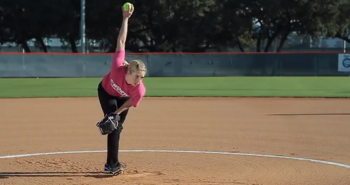 What’s your biggest worry about playing softball in college? 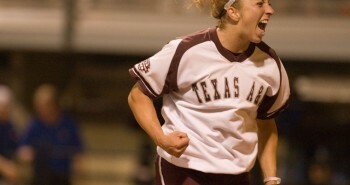 What do you get most excited about when it comes to playing softball in college? Do you have any questions for me? — go ahead, ask below! Great article. I have an off topic question that I would like you to answer. Can I email you the question? Thanks for this article… sounds busy, but it’s more or less my life already!! I am a high school sophomore and am beginning to consider maybe trying to play college softball. What division school did you attend? I have been looking at Bryan College in TN which is Division II I believe. Thank you so much for this article. I’m going into high school softball as a 7th grader and I’m in that time where I’m getting more serious about the sport and this was really a great motivation! I loved the info ! I’m doing a project on college softball and I was wanted to ask what education is required to play softball or does having to play softball depend on the major you have such as having to deal with time management ? To play softball in college you definitely have to make good grades to be able to get into college. Every college will be different for what those grades are. When you get to college, you are required to maintain a certain GPA to remain eligible to play. If you do not have that GPA, you are not allowed to compete. Time management is a huge part of being a college athlete. Finding a major that you like, that you feel ike you have enough time to study while also putting time in on the softball field. 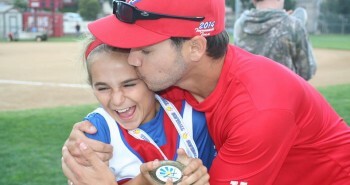 It’s all a choice for what you specifically can handle to be able to balance school, softball, friends and family. What was the off-season workout itself?